So many times… – …STILL CRAZY AFTER ALL THESE YEARS! …as the man who has been the best man at weddings for the most number of times. Later, I heard that he had opened a kampua noodle stall at Taman Muhibbah and this was where Huai Bin took this video clip of him in action, tossing the noodles into the air while cooking and catching them as they came down…and I have heard people praising his kampua but personally, I never got round to trying it. If I’m not mistaken, other than the one at the hawker centre that opens only at night, there is at least another kampua stall in town with the same name, Siong Kee Mee – I wonder if they are connected but what I know for sure is that he himself is presently stationed at this particular coffee shop at the corner of the block of shops immediately after Delta Mall, facing Tom’s Too, if you are going along Jalan Pedada. I did drop by a few times around lunch time but either the noodles were sold out or they had closed for the day. I paid RM5.50 for the combo, so I guess it was RM2.50 for the noodles and RM3.00 for the soup. Were they any good? Well, I liked the soup, very tasty with just the right amount of Foochow red wine, and the beef tripe was very well done – soft and chewable but I thought the chili dip that came with it was very sour and not as nice as others elsewhere. To me, the noodles were disappointing as I found it somewhat starchy. Maybe, he did not cook it long enough to let the starch disperse in the boiling cauldron of water…or the water was already too starchy and he did not change it…or perhaps, it was the cornstarch in the chili sauce – I had asked for the noodles to be tossed in chili. But don’t take my word for it though! The patronage that he seems to enjoy and the number of praises that have reached my ears are obvious indications that many do not think the same way as I do…or perhaps it was just my bowl of noodles that did not come out quite right, I wouldn’t know. – possibly one of the best I had in town except that it was a little too sweet so the next time around, I would ask them to cut down a bit on that. Wanna meet for breakfast there, anyone? I too, place a lot of emphasis on the ambiance of the eatery and drinks served. 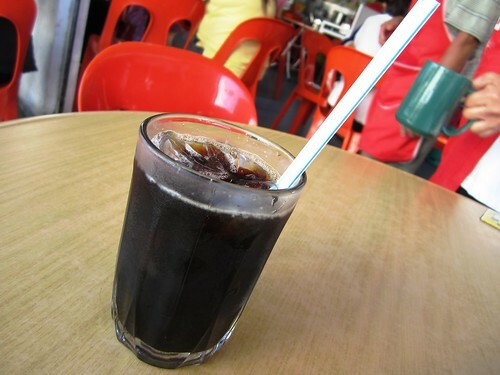 Nothing like a well-prepared kopi or teh to wash down the good food consumed. I like this place as well, my favorite is still hands down the one beside the tuition center, just around the corner facing the church. wow!!! being a bestman for 1445 times in like 30 years?? really unbelievable, it’s like EVERYDAY you know?? 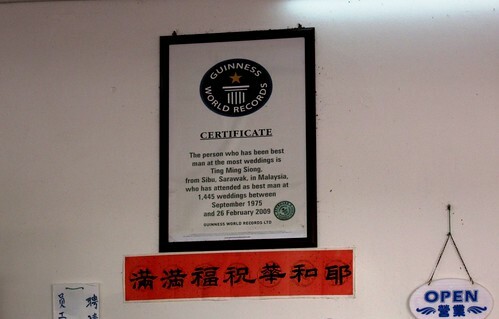 and is that guinness record a genuine one?? is he a professional bestman for hire or he just has so many friends?? Yup, he’s some sort of a professional best man – knows all the traditional practices…conducts all the ceremonies…but in Chinese. If I’m not mistaken, he was a barber before…and all this while, he has been the best man at weddings – very famous in Sibu, great demand. Somehow or other, he branched out into this kampua noodle business eventually. only RM5.50 for that combo?? eih, that’s cheap, really cannot get this with price here, the noodles or the soup itself may have already cost us RM5.50.. I wish to try the gu tor…so you are Hokkien? is the guy doing side business .. best man for hire? the cert ORI or not? Yup, he’s a best man for hire all right…but he conducts everything in Chinese. Bananas like me would have no use for the likes of him. You can try and google to check this out on Guinness world record website to verify this, if you are doubtful. What I know is the moment he got this award, the IRD (LHDN) people came to see him and they calculated an estimate of how many ang paos he received and the total amount he would have earned over the years…and he was fined for undeclared income!!! I dunno if there was any prize money involved that could help him to pay off the fine. You’re looking for a date, a suitable date? You’re bringing another girl, not Janice kah? Muahahahahaha!!!! Jokes aside, let me know as soon as you have fixed when you will be coming. I’ll be right here to welcome you. Kopi O peng! Wow…….that’s my mum’s favourite! Me me me me me!! Make sure you remind me again on this place for kampua, too many in the list later i tend to forget! 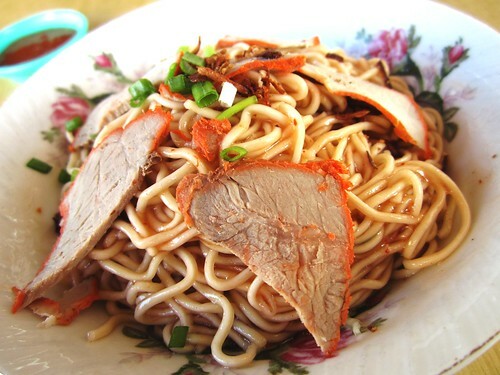 There’s another place at Lanang Road where you can get to see “flying kampua” – a lady…but I don;t know if the mee is any good. Will have to look for it and give it a try. I did not really like this one. WOW!! I’ve never seen a person sells or prepares Kampua dress professionally. Esp. that chef hat! Made me miss a bowl of kampua with pig’s liver soup!!! Wah, the Uncle looks so handsome..so well-dressed and so out of place…hahaha.You would expect him in a posh Japanese Restaurant ( he looks Japanese ) or at least pun those 7 star Chinese Restaurants.The price for the kampua and soup so cheap lar…in Melbourne, a miserable bowl of soup without any meat already AUD5.50.Don’t complain, you got it good there!!! Hahahahaha!!!! I should appreciate it, hor? And yes, now that you mentioned it, he does look Japanese…like those on that tv show – the Iron Chef! LOL!!! Both my favourite, gu tor soup and Kopi-O peng. Am a coffee lover. The man looks professional with the chef hat. Walau-eh, u hv got chef serve in your hawker centre! The kampua looks great, sure… perhaps one day might join you for breakfast/ lunch! Looks impressively clean – hat and apron. 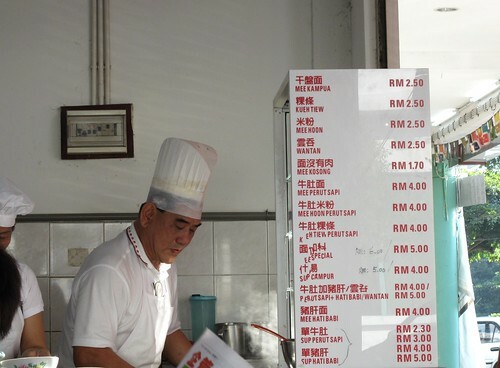 Compared to that Penang hawker I told you about, the one selling fried mee sua – he sat there smoking coz no customers then…wonder whether he’d wash his hands before the next fry-up…..eyeeew! That is so cheap! To get both of that at just RM5.50! I’d love the soup and the noodles too (if it is not so starchy) as I love my noodles being tossed in chilly too 🙂 but pls, no coffee for me. First time seeing a hawker all dressed up like a chef. Surprised that his kampua is not priced more expensive. I wonder if he regretted he got that cert. lol! I think the noodle is starchy because of the chili saucce that he has added in. Probably. Will go back and try again and skip the chili sauce this time. I love the gu tor soup, very nice. They look really nice in the pictures but sad to say you were disappointed. 3 of my cousins who married early 90’s are among those 1445. When i got married in 2004, he was semi “retiring”. Or else the record will be 1446. K. Guess he’s older now…and people go for the more modern wedding planners these days. He must be good at it or else there would not be so many people recruiting him for the job – must be very well-versed with the traditional Chinese/Foochow practices and customs. Pingback: She wants… | ...Still crazy after all these years! Pingback: Familiar place… – …STILL CRAZY AFTER ALL THESE YEARS! Pingback: You’ve made me stronger… – …STILL CRAZY AFTER ALL THESE YEARS! Pingback: Following footsteps… – …STILL CRAZY AFTER ALL THESE YEARS! Pingback: Family business… – …STILL CRAZY AFTER ALL THESE YEARS!